Although today was the official first day of winter, we've been having winter weather for the past month or more. The temperatures have been fluctuating between 20 to 40 degrees Fahrenheit everyday so it's only natural to want to make and eat comfort food. Our go to comfort food is some kind of rice dish. It should have vegetables and protein so you are not just "carbing" it up. 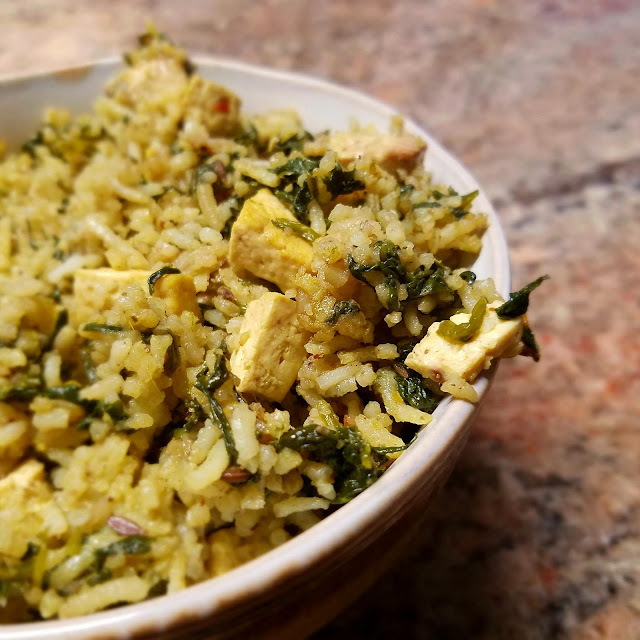 Below is a recipe for easy Spinach and Tofu rice. In a large skillet, heat oil and add whole cumin. When it starts to sizzle, add turmeric powder, crushed chilies, and ginger-garlic paste. Stir for few seconds. Then add spinach, sprinkle some salt and stir the mixture until the spinach leaves are wilted (cook for about 3 to 4 minutes). Next add garam masala and mixture well. Then add cooked rice, tofu and salt as per your taste. Mix well until the spinach is evenly mixed into the rice. When it's ready to be served, top with fried onions. This dish can be enjoyed on its own or eaten with cucumber raita (yogurt dip). It's comfort food for the soul. - We freeze tofu for 3 to 4 hours to keep it firm and thaw it for a bit when we need to use it. This way it doesn't crumble when we cut portions of it. - Try our other rice dishes made with beets, coconut, and/or lentils.